I was first introduced to the American version of a food hall in a historic City Market Building in Roanoke, Virginia in 2012. It was my first time in one despite the fact that food halls have been in larger, metropolitan cities for years. 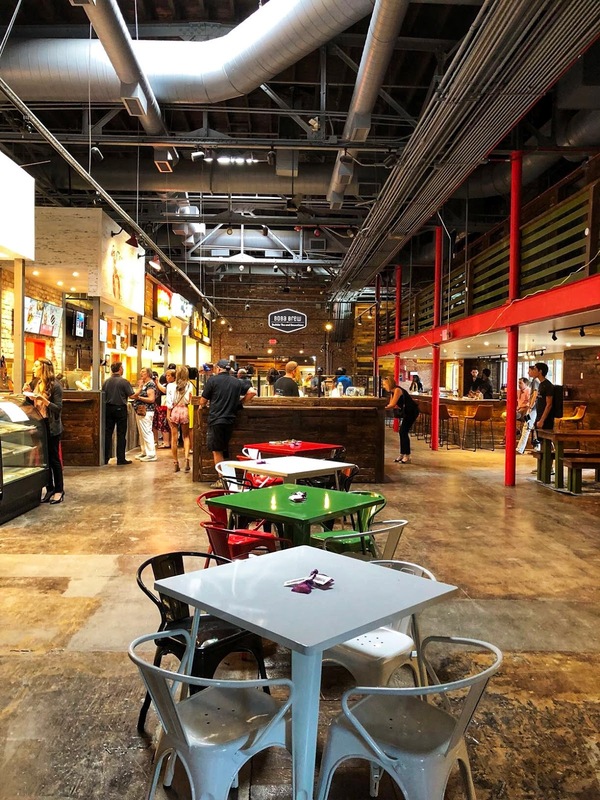 When someone from Hotel Roanoke suggested the food hall to my family, my mind wandered to an original mall food court for the concept and I was a little puzzled as to why they would suggest a food court as a place to dine in their city. But, as soon as I walked through the doors of this historic building, I knew this was different. This Virginia food hall felt hippier, trendier, more expensive than a mall food court, and of course, there was not one Chic-Fil-A sign in sight. Raleigh, North Carolina now has its first food hall and it rivals some of the best European and U.S. Food Halls in the country. North Carolina has reached the big time when it comes to good, local food in one place. The Research Triangle Area is quickly becoming a foodie mecca, and it's an accolade I think residents are glad to embrace. 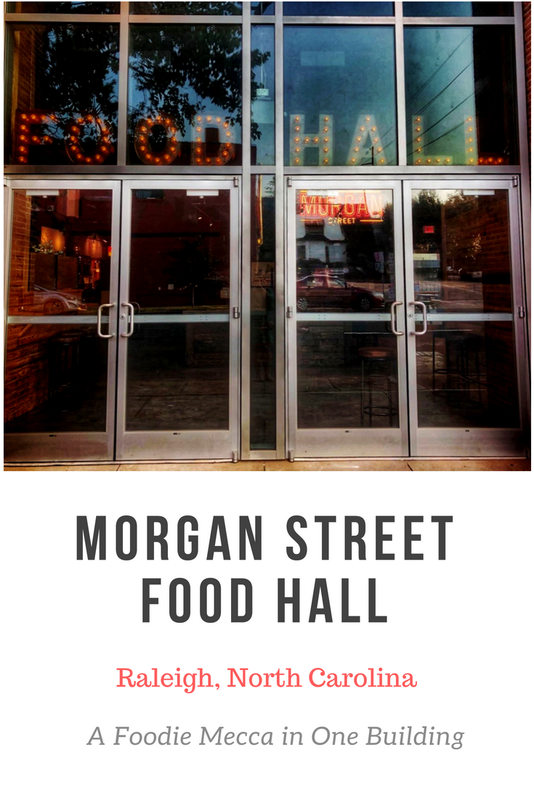 My Facebook is constantly buzzing with excitement about Morgan Street Food Hall, located in a long-abandoned industrial space that used to be a pool hall when I moved to Raleigh in 1999. A second food hall called Transfer Co. Food Hall will also open later in the year in a different part of downtown. 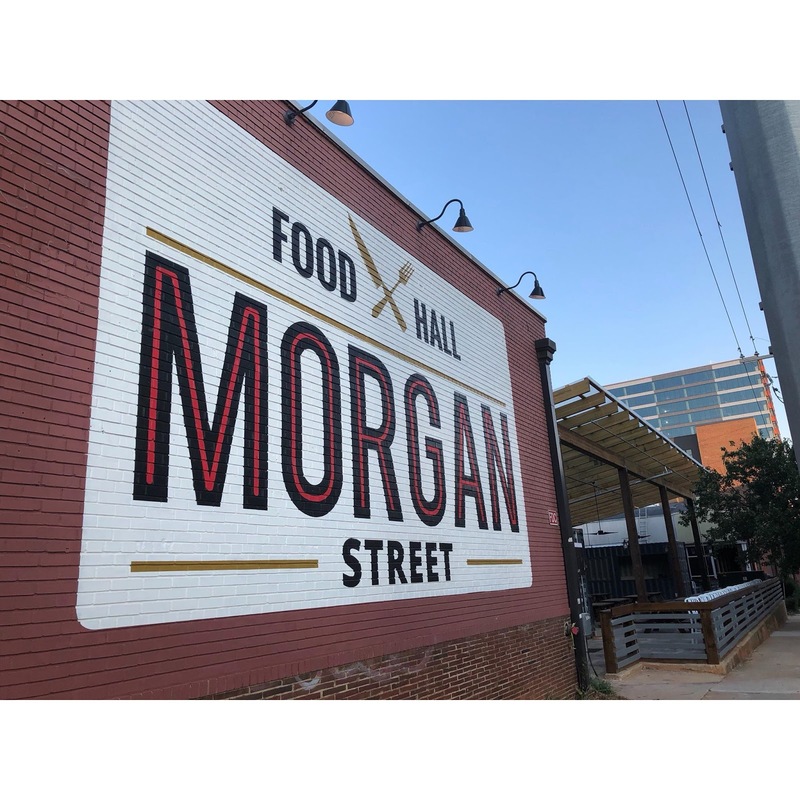 Blogger Tatiana Amador covered the media opening of the Morgan Street Food Hall for my OutaboutNC Instagram, She's sampled lots of local goodies and has the scoop on what you can find to eat and some important things to know before you go. MORGAN STREET FOOD HALL LOCATION and PARKING: Morgan Street Food Hall is located at 411 West Morgan Street. It is adjacent to the new Raleigh Union Station. You can find street parking or you can park in the Dillon Parking Deck. 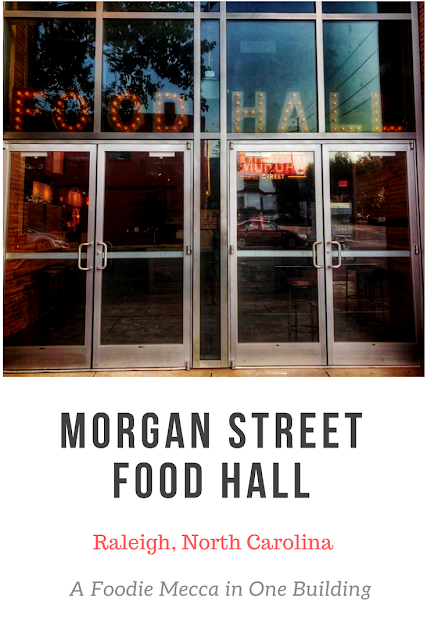 MORGAN STREET FOOD HALL HOURS: The food hall is open Sunday to Wednesday from 7 a.m. to 10 p.m, and from 7 a.m. to 2 a.m from Thursday to Saturday. Keep in mind that not all food vendors open right at 7 a.m. though. The majority of the food vendors in the building keep 11 a.m to 10 p.m as its set operating hours daily. Cocktails and Drinks are available until closing hours. There are currently 19 food vendors and 15 specialty vendors, including a florist, barbecue sauces, and teas! Bella’s Wood Fired Pizza & Tapas: Small plate tapas and wood-fired pizzas made with fresh ingredients. Boba Brew: Authentic Bubble Teas, non-GMO added smoothies, and monthly menu changes keep Boba Brew refreshing and unique. Carroll’s Kitchen: A non-profit restaurant trying to end homelessness for women, Carroll’s offers up freshly baked sweets and comfort classics like chicken noodle soup. Cocoa Forte: A two-year-old chocolate business with desserts from waffles on a stick to chocolate dipped cheesecake bars. Cousins Maine Lobster: As seen on “Shark Tank,” this nationally known truck brings fresh Maine seafood to a brick and mortar location in the Triangle. Curry in a Hurry: (Tatiana's personal favorite) Alaksha, the owner, brings love and passion into her dishes. 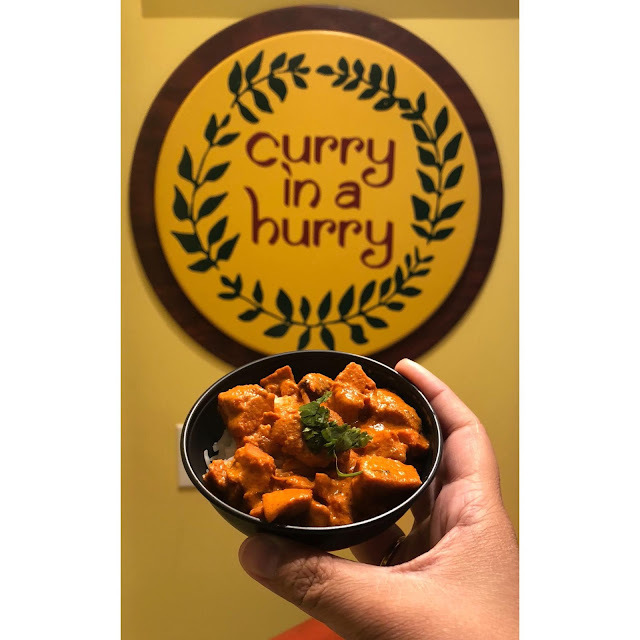 Explore the tastes of India at the Curry in a Hurry booth. Iyla’s Southern Kitchen: Iyla’s is one of the only residents bringing Southern cuisine to the food hall and rises to the challenge with a unique twist on Southern classics like their barbeque sundae. Makus Empanadas: Two brothers have been sharing their Argentinian roots with NC for the past couple of years. Now at the food hall with the same menu as their truck, its a must try! Mama Bird’s Cookies + Cream: One of two ice cream shops in the food hall, Mama Bird’s stands out because of their distinct, frozen spin on classic desserts like tiramisu and cheesecake. 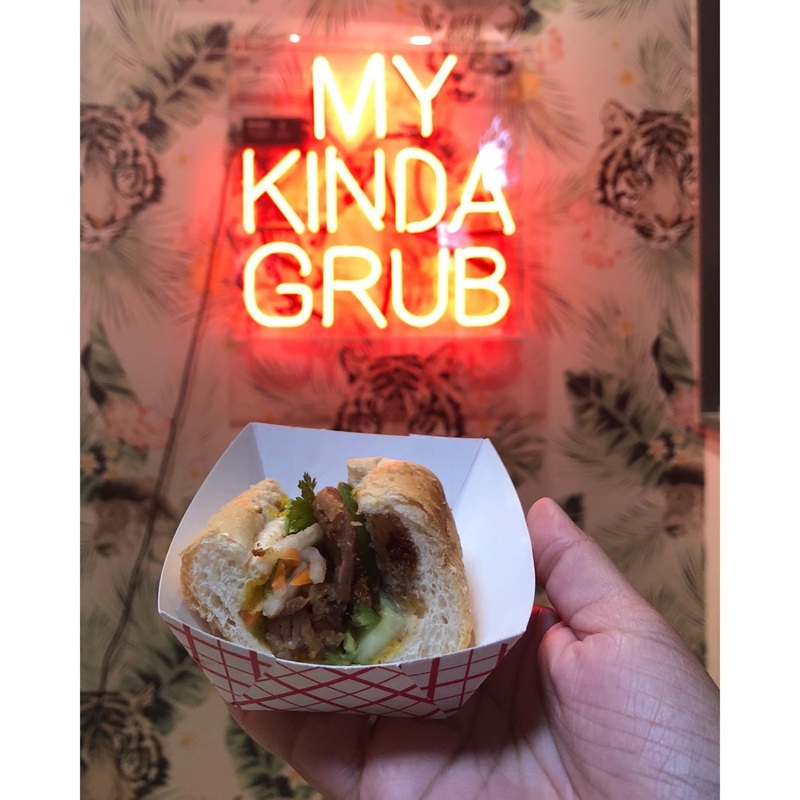 MKG Kitchen: Selecting fresh ingredients daily, MKG is looking to bring the highest quality to a menu featuring homemade Vietnamese recipes that focus on the less commonly known elements of the Southeast Asian country’s cuisine. Morgan Street Java & Creperie: Rotating seasonal offerings will take advantage of local ingredients to provide a variety of made to order crepes and a diverse coffee menu. Oak City Fish & Chips: Oak City Fish & Chips uses their two proprietary spice blends to give a unique spin on a classic dish and help their fish and chips, and other seafood dishes, stand out among the other fish in the sea. Raleigh Raw: After enjoying a few of Morgan Street Food Hall’s less than healthy options, a trip to Raleigh Raw may be just what the doctor ordered with their focus on providing healthy, organic, bottled juices. 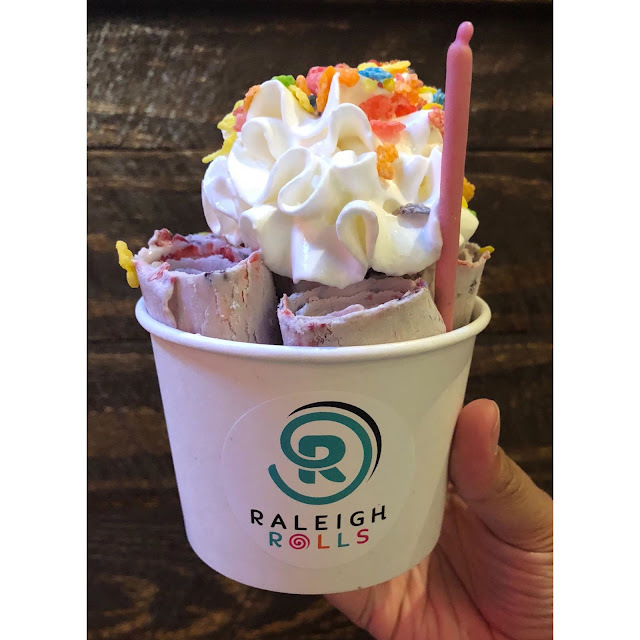 Raleigh Rolls: The employees of this Thai inspired ice cream joint make a show of preparing your order by pouring cream directly on to an ice grill before adding in a wide variety of toppings and rolling the flash frozen cream up like a tiny, edible sleeping bag. 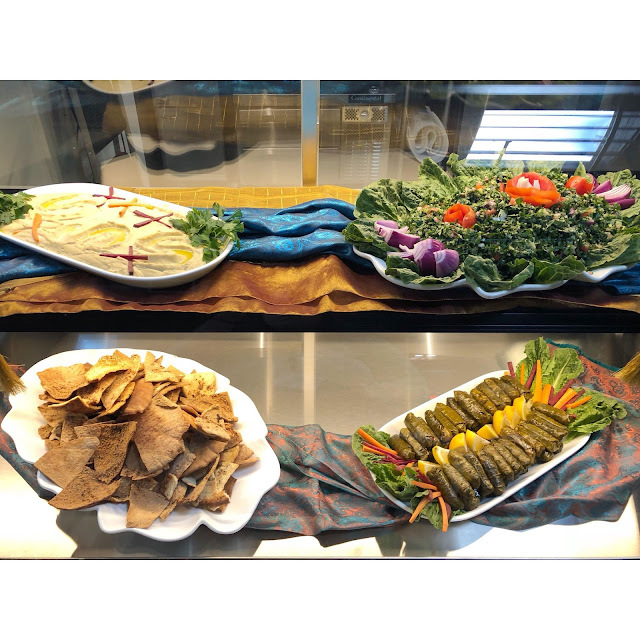 Sassool: With locations already in Raleigh and Cary, Sassool offers Mediterranean and Lebanese favorites such as chicken and beef shawarma, and falafel. The Bowls: Expect a tour of various East Asian cuisines at this vendor, which names each of the rice bowls on its menu after different East Asian cities. The Broth: The Broth brings Japanese style comfort food and street food favorites to Raleigh with their carefully crafted bowls of ramen, steamed buns, and other dishes. Wicked Taco: This well-known taco establishment brings its popular tacos and salsas to the patrons of Morgan Street Food Hall. There are two full-service bars inside the building and one on the outside patio where Raleigh Raw is located. You can hang out inside in the shared space booths and tables or lounge in their sitting room with comfy couches. Morgan Street Food Hall is the place you can go into at any time of day and feel at ease. There is something for every foodie at Morgan Street Food Hall. What vendor are you most wanting to try? Southern Hospitality Rules At Washington Duke Inn, a Resort in Durham, N.C.
Durham, N.C., the epicenter of the Research Triangle Park, is not known as a resort destination. But, nestled on the campus of Duke University, is a tranquil peace of resort heaven, known as the Washington Duke Inn and Golf Club. It transports guests away from the hustle and bustle of daily life and opens its door for you to enjoy a slower-pace oozed with Southern hospitality. 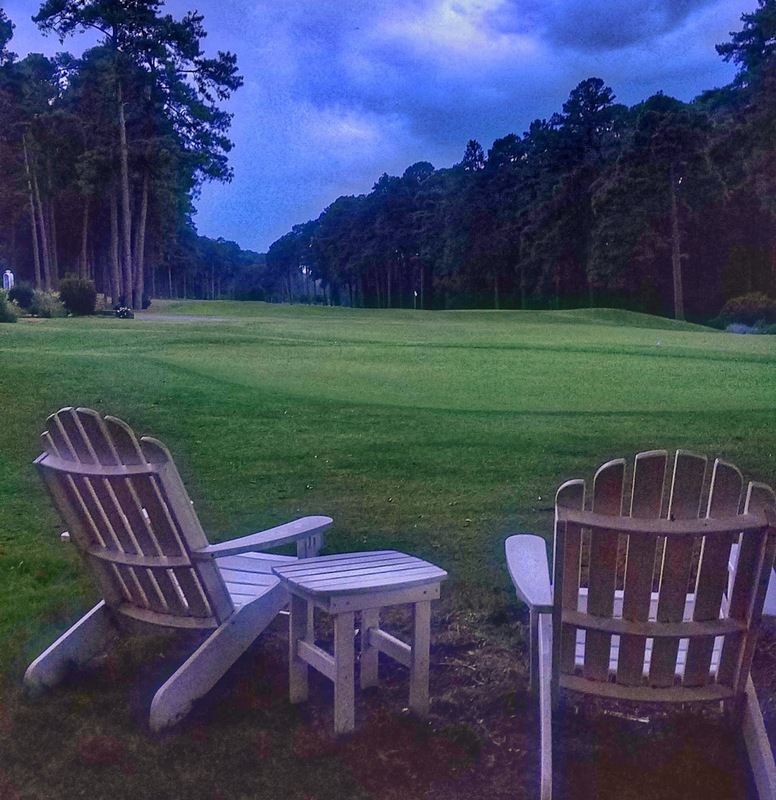 The stately inn, nestled on 300 acres on the edge of Duke Forest, is owned by Duke University. 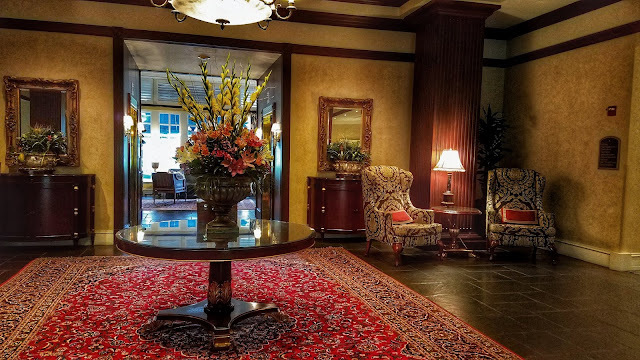 Some weekends, you will be hard-pressed to find a room available at the Washington Duke Inn, which could easily be mistaken for a country English estate in Durham, England, not North Carolina. But, the good news for you is that sometimes the hotel is less busy such as when Duke University students are not on campus or when the Duke BlueDevils are not playing a home game. Summer is one of the less busy times for the hotel and as a result, you will find incredible rates and packages that every local or seasoned traveler should experience. 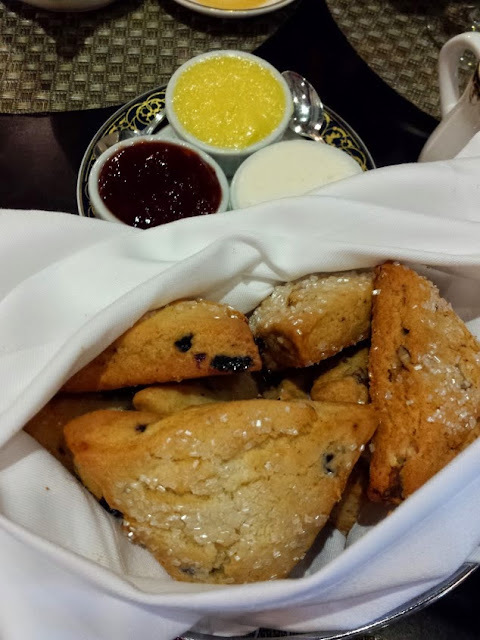 Under the culinary leadership of Jason Cunningham, I've been a fan of the Washington Duke Inn tea service for several decades now. They have the best scones in the state and an elegant tea service. It is also a perfect experience for kids. My son had his first tea in the Fairview Dining Room when he was seven. 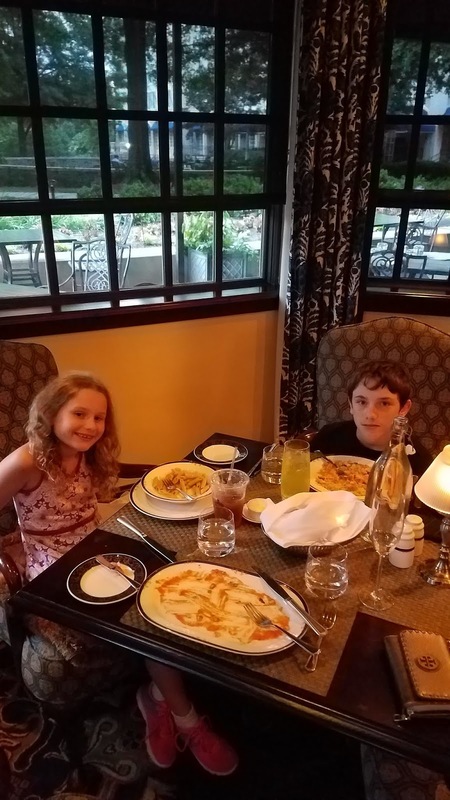 Every time I have dined at the Washington Duke Inn restaurant in the past, I have had an exceptional dining experience. I am a huge fan of the Fairview Dining Room, which is the official name of the AAA four-diamond ranked restaurant. 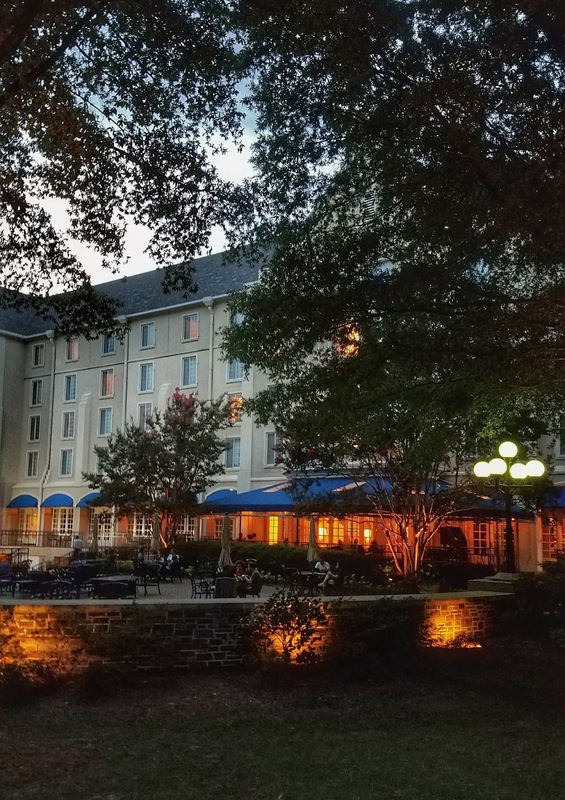 One of the best local secrets is that the Washington Duke Inn menu features the special Dinner at Dusk Menu, offered from 5:30 p.m. to 6:30 p.m. at a special price of $35 for three courses. The value alone in that meal is crazy good. The Washington Duke Inn is also known for its weekend brunch so it's a popular spot for Duke students, alumni, and their families. Chef Cunningham has younger children than my two so he understands the struggles parents have when traveling. Parents, like myself, want great food, but here is Liza, who lives off of buttered noodles, a cheeseburger, and an occasional nugget. Meanwhile, my soon to-be-13-year-old is a self-exclaimed foodie, and we have to limit him or else, we will have to get a bank loan on his choices. 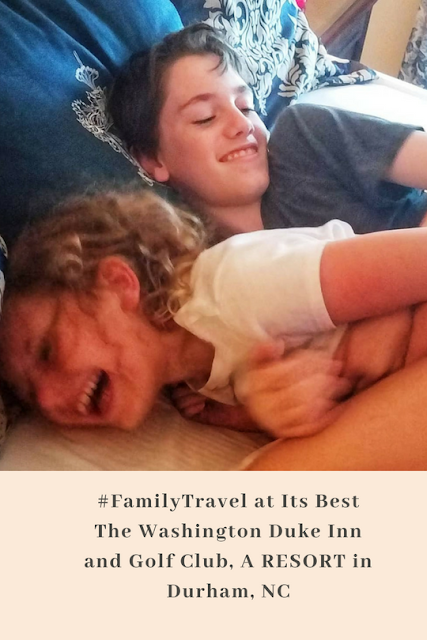 The Washington Duke Inn also operates the Bull Durham Bar for more casual salads, burger and sandwich options which is a perfect choice for families who need a less quiet atmosphere. I've dined here for lunch with the kids when we visited the nearby Duke Lemur Center. 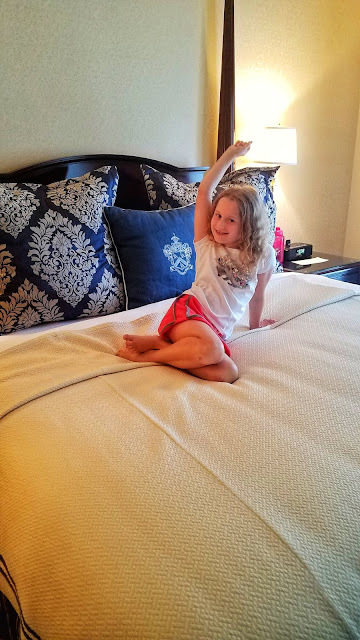 Despite the numerous times I've dined at the Washington Duke Inn through the years, I had never stayed overnight and experienced what it would be like as a resort guest until this year. Even though Durham is only 45-minutes away from Raleigh, just getting out of the house for one night with the kids felt like a vacation this summer. As you know, I'm fine with just enjoying resort amenities and never leaving a property if it is for a short amount of time. One-night away was the perfect subscription for genuine family bonding. Even though the Washington Duke Inn is pet-friendly, Andy and my husband stayed home. Will had to work the next day and I thought I would be brave enough to take the kids to a hotel alone. Washington Duke Inn chose the family suite for us and it was a special treat for the kids. 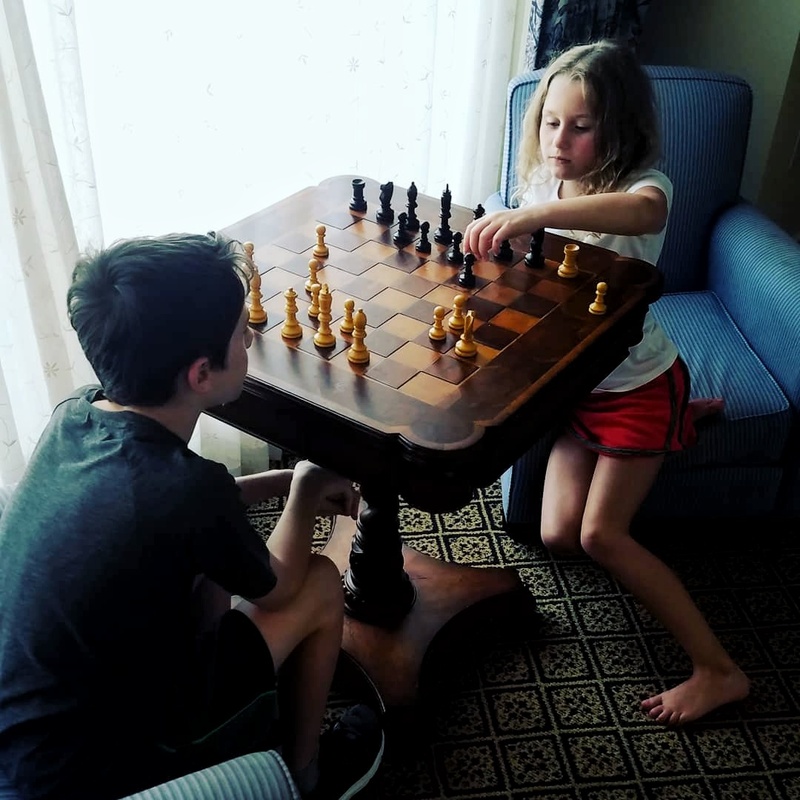 It was a king bed with an alcove area with two bunk beds plus an awesome child-sized chess table. You book this suite for the fun and not the view. It is more expensive, but larger in size than a regular double room. Don't fret though, you will have the same ambiance in a regular room if the cost per night is more than your travel budget allows. This type of suite runs about $50 more than a regular double. Room rates start at $200 at the Washington Duke Inn during non-peak times. 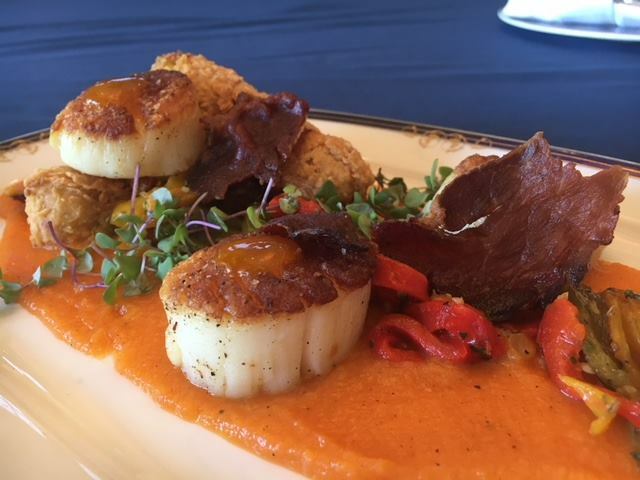 I've already mentioned how much I like the food at the Washington Duke Inn in the Fairview Dining and the Bull Durham Bar, but I cannot write this piece without mentioning the scallop dish that is currently on the seasonal summer menu. It was pan-seared diver scallops with grilled silver queen corn, piperade, Spanish bacon, local basil aioli, and organic carrot puree. Thank goodness for google because I did have to look up the definition of piperade. Simply put, it's French Basque dish, a saute of peppers, onions, and tomatoes. This particular dish is not on the special, lower-cost Dinner at Dusk menu though. My husband is so tired of hearing how good the scallop entree was at the Washington Duke Inn that's for sure. 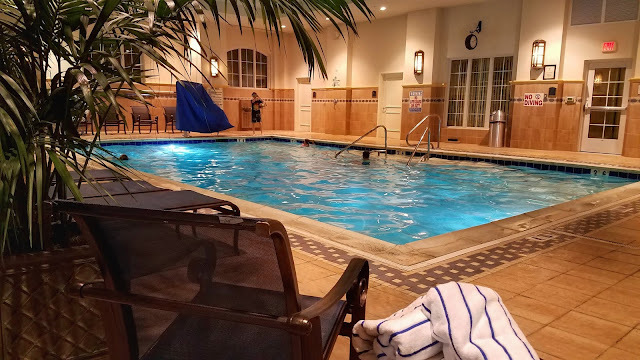 The Washington Duke Inn has a gorgeous indoor pool which is fun for kids year-round. I personally love the grounds of the hotel because it overlooks the Washington Duke Golf Course. Guests at the hotel get a special discount for golfing and there is a great golf store on site. The club also offers lessons and week-long courses. Every time, I go to a golf course, I say I want to take up lessons. But, for now, I 'll settle for a sparkling rose overlooking the green. This terrace is a wonderful spot for a casual dinner or just drinks before a performance at DPAC in downtown Durham. Luxury Hotel Perks You Will Enjoy at Washington Duke Inn in Durham, N.C.
*Comfy high-end bedding. Mattresses are somewhat firm. *Drools in Southern hospitality, and if you ask me, that's a good thing!!!! And just when you thought this story could not get any better, the Washington Duke Inn has a sister hotel less than a mile from the Inn called the JB Duke Hotel. 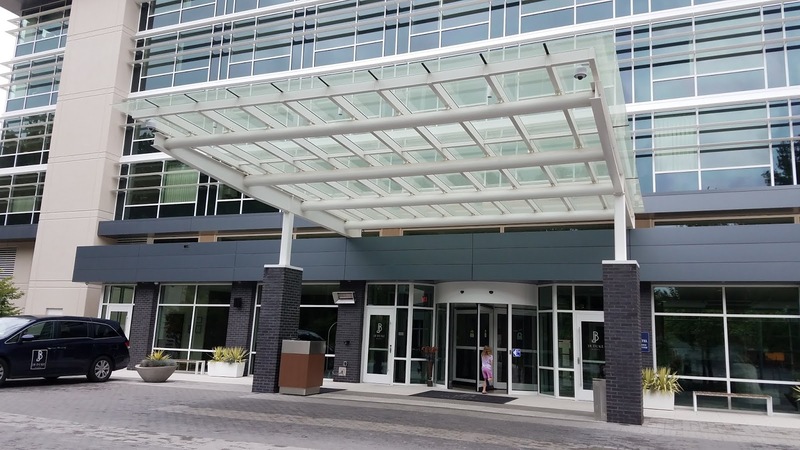 This contemporary property near Duke's Fuqua School of Business and Duke's baseball stadium is also a four-diamond rated, but has a completely different tone and feel that Washington Duke Inn. Due to the hotel's relationship with the business school, guests typically stay longer (think meetings and conferences) at this property, but it does attract the leisure guest, too. I had breakfast at the JB Duke Hotel and toured the property with staff. There is no pool, but it has an awesome fitness center and amazing suites. Package rates typically start below $200 at this property. This fall, I'll tell you more. Disclosure: I was a hosted media guest of the Washington Duke Inn, but this is an editorial piece and opinions are my own. Only a few people knew I was media so my experience resembled any other family.